LLOYD'S BEWARE THE BLOG: DISNEYLAND 1955: A Childhood Memory of WALT DISNEY'S Original "Magic Kingdom"
DISNEYLAND 1955: A Childhood Memory of WALT DISNEY'S Original "Magic Kingdom"
When I first saw DISNEYLAND PARK it was known as either "The Magic Kingdom", or "The Happiest Place On Earth". Over the six decades since Walt Disney conceived his dream Park. There have been many changes to the Park's look and rides. Some have worked and some have not. On February 8, 2001 after the original parking lot area was demolished and a structure built on part of the original Hotel's Parking Area. 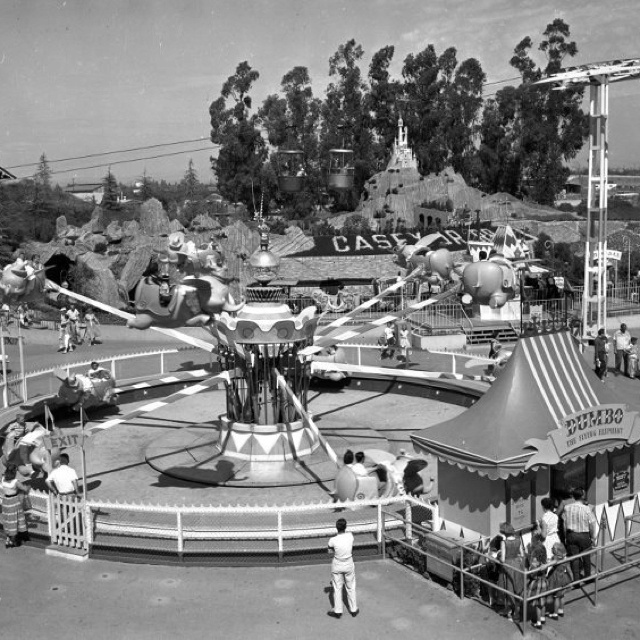 Walt Disney's "California Adventure Park" opened in Anaheim. 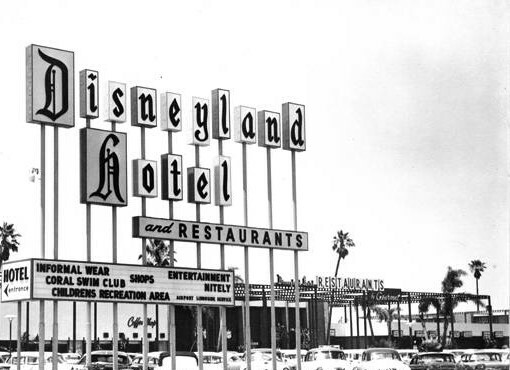 The same year saw the shopping area "Downtown Disney" open. Along with two new Hotels. The Anaheim Park is restricted by its size as indicated by the way "California Adventure" was created, Scheduled to open within the area of the original park, in 2019, is a complete "Star Wars Themed Land". 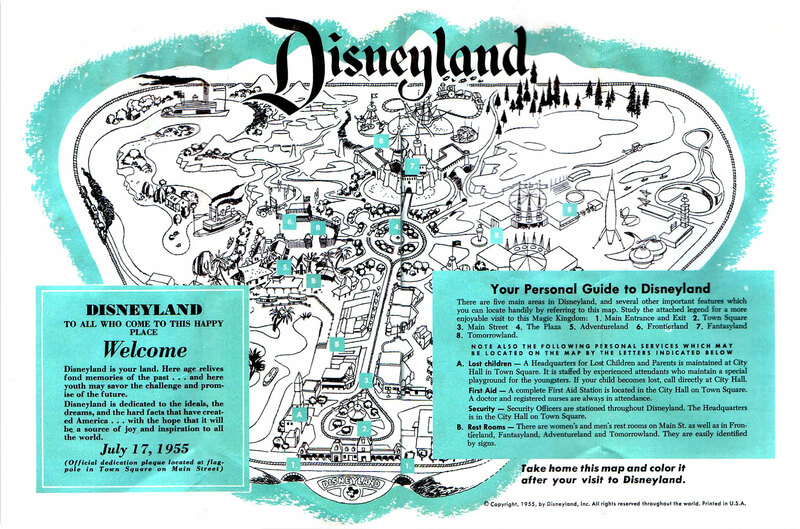 So, if my readers will let me, I want to "Wax Nostalgic" and take them back to when I first saw "Disneyland". A short few months after it originally opened in 1955. THE CREATION OF "THE MAGIC KINGDOM"
On our 21 inch black and white television set like millions of Americans, each Wednesday evening, I would watch "Disneyland".The anthology series from Walt Disney premiered on October 27, 1954. 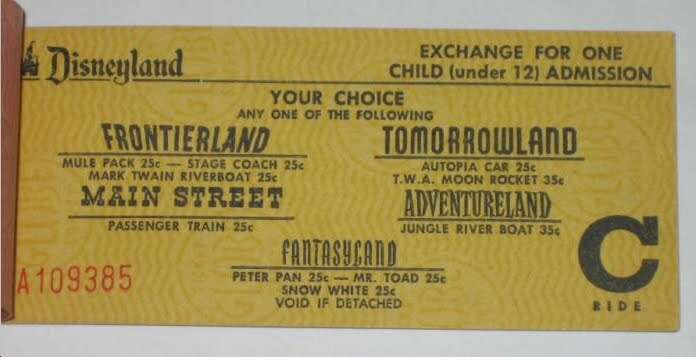 The format was divided into four segments: "Fantasyland", "Adventureland", "Tomorrowland" and "Frontierland"
When it was "Fantasyland" I might see cartoons, or scenes from one of Walt's animated motion pictures like "Alice in Wonderland". "Adventureland" night might show part of one of his Nature films like the Oscar winning "The Living Desert". "Tomorrowland" dealt with the possibility of the future and I might see "Man In Space", My favorite was always "Frontierland". Where I first saw Fess Parker as "Davy Crockett, King of the Wild Frontier". Walt would be seen at the start and at the end of each weekly program. Many times that end segment not only told of next week's show, but was used to promote an upcoming feature film with behind the scenes segments, or film clips. 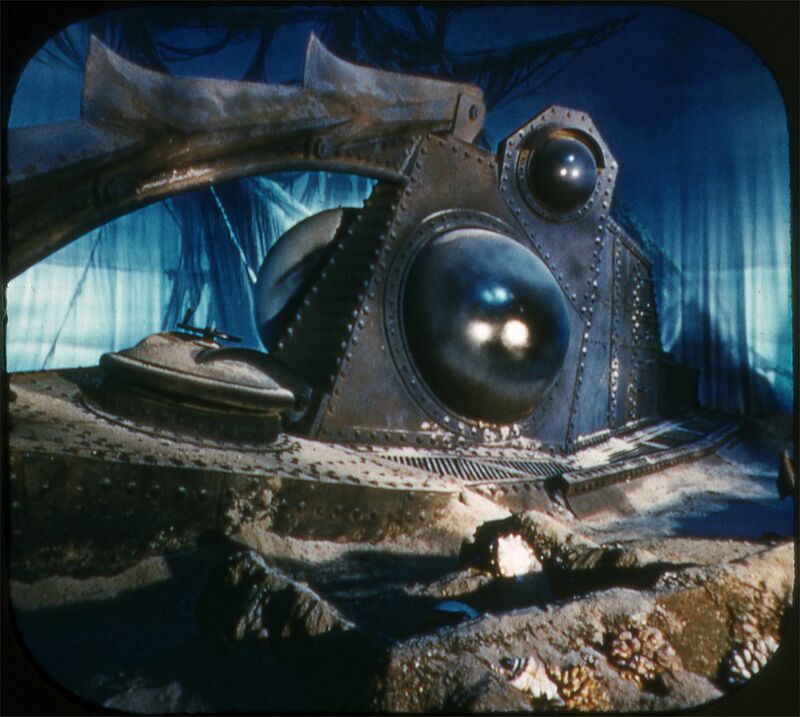 Below the squid from "20,000 Leagues Under the Sea" as seen on an early episode of the "Disneyland" television program as part of a seek preview of the, then, upcoming motion picture. 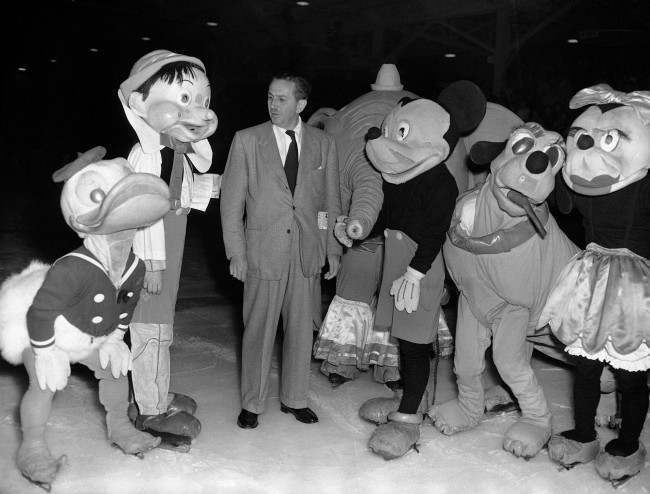 The was also used as a way that Walt Disney started to tell his viewing audience about his dream. An Amusement Park like no other. It would also be called DISNEYLAND. The Park would be divided into Five Sections. 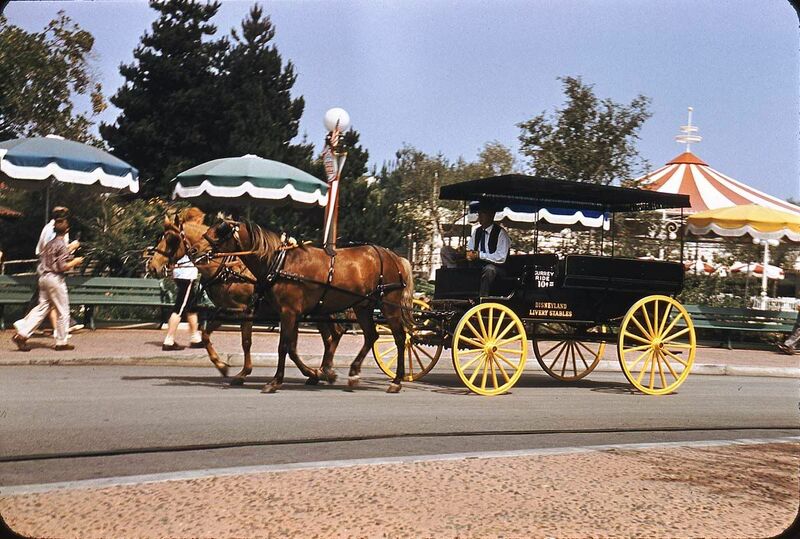 The "Guest" would enter "Main Street" which was a small recreation of early 1900 America. 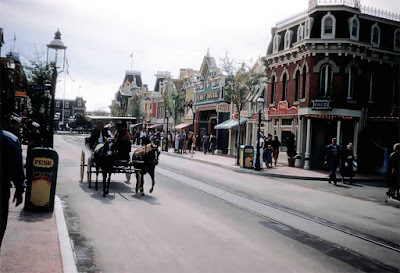 At the end of "Main Street" was a hub that would take a visitor on the left to either "Adventureland", or "Frontierland". On the right to the future of "Tomorrowland". At the hub's center dividing the lands was "Sleeping Beauty's Castle" the entrance to "Fantasyland". BUILDING "THE HAPPIEST PLACE ON EARTH"
Walt Disney purchased 160 acres of Orange Groves in the small rural community of Anaheim, California. 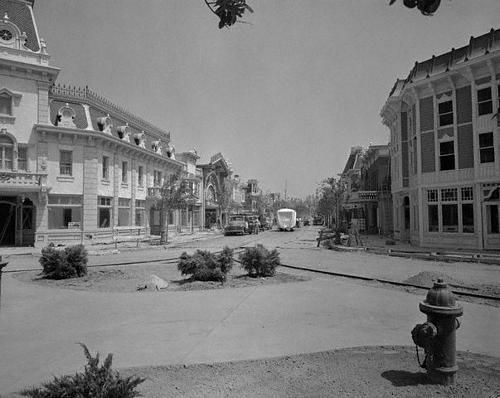 An unimagined mistake, the impact of his Park on the city's growth, was made by Walt at that time. The area had been Farms and Orange Groves since 50 German Immigrant Families founded the town in 1857. In the 98 years from the city's founding to the building of "Disneyland". Anaheim had basically remained a rural community. 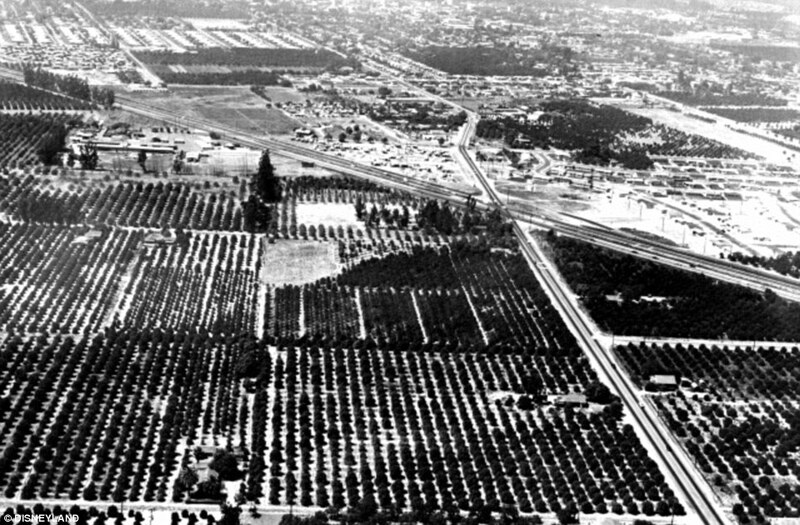 The idea of buying more land around the park for future development wasn't even thought about, because who else would want those Orange Groves and Farms? Based upon the rate of growth established in 2010 by the U.S. Census Bureau. The "City of Anaheim", located in "Los Angeles County" at the time of Disney's purchase, but now in "Orange County" was estimated to have a population of 351,036 in 2016. A major difference from it's approximate 6,000 in 1955. At the time "Disneyland Park" was built. 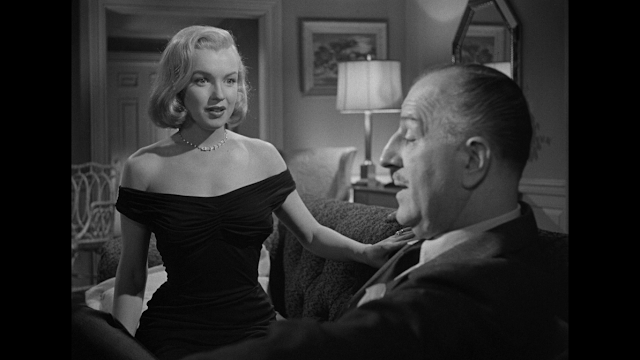 The final 1955 cost was $17 million dollars, or recalculated for inflation into 2017 dollars. $156,564,291. 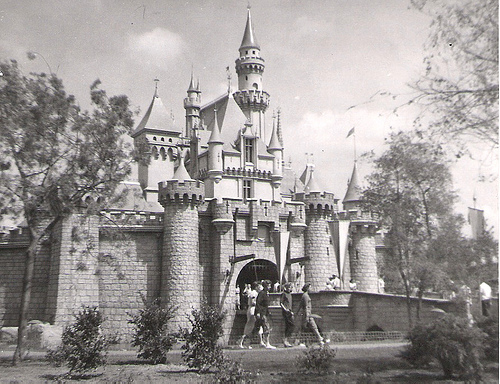 Below the front entrance of Disneyland Park in 1955 and a look at the backside. Showing the original parking lot and entrance. 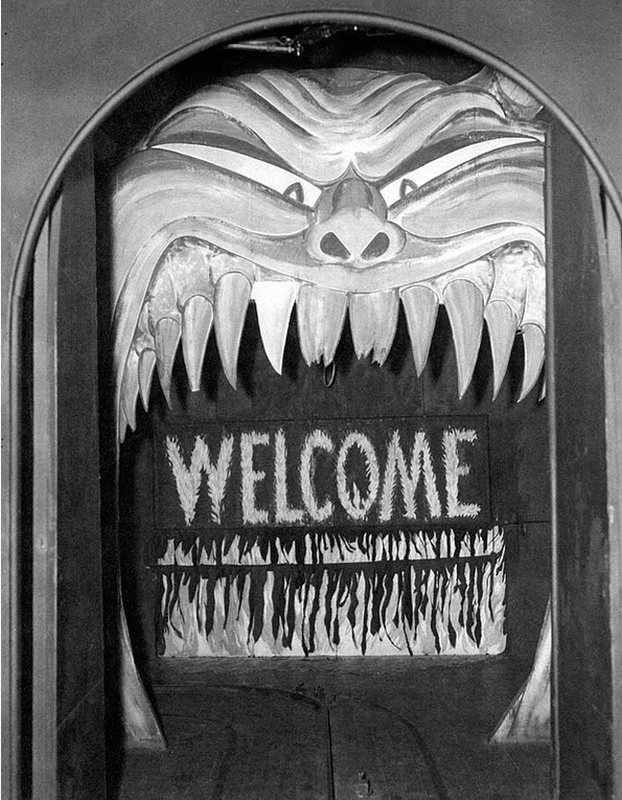 The date was Sunday, July 17, 1955 and the gates opened for the very first time at 2:30 PM PST to a "By Invitation Only Audience". At 4:30 PM ABC started a live broadcast from the park and as live television goes things did not run smoothly. Somebody should have warned all the ladies in high heels that they might sink into the newly poured asphalt from early that same morning for instance on "Main Street". However, like millions of Americans and many Canadians able to get the live feed. I was "glued" to the couch and television screen as some actor named Ronald Reagan introduced Walt Disney. To all who come to this happy place: welcome. Disneyland is your land. Here age relives fond memories of the past...and her youth may savor the challenge and promise of the future. Disneyland is dedicated to the ideals, the dreams and the hard facts which have created America...with the hope that it will be a source of joy and inspiration to all the World. Those present that day besides Ronald Reagan included co-hosts Art Linkletter and Bob Cummings. The Governor of the State of California Goodwin J. Knight came down for the opening. Also appearing were the original "Mousketeers" and Fess Park as "Davy Crockett" Those receiving the special first day ticket was estimated at 28,000. Above the three hosts Ronald Reagan, Robert "Bob" Cummings and with his side to camera Art Linkletter. 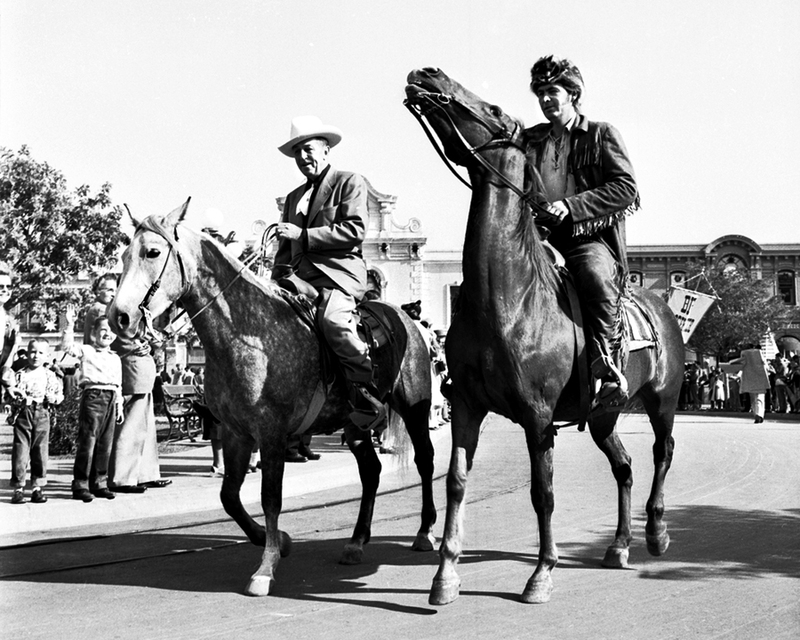 Below Fess Parker riding in the parade with Walt Disney. 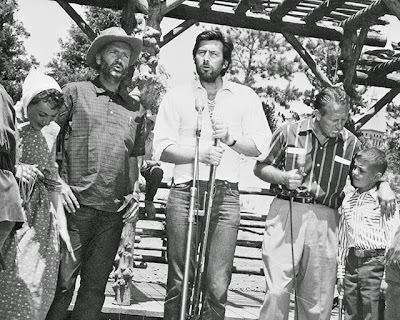 Above Buddy Epson, Fess Parker and Art Linkletter in "Frontierland". The following photo from the opening day parade introduced the original "Mousketeers". Three months prior to the premier on television of the "Mickey Mouse Club". 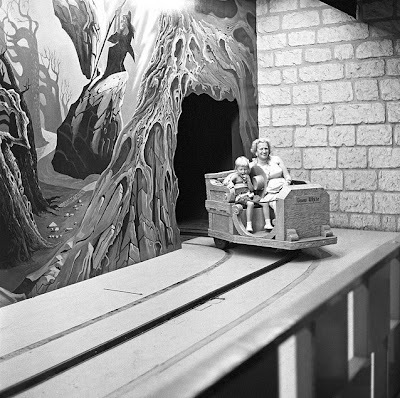 The first "Snow White" rode a float with the original "Seven Dwarf" characters. A Major traffic jams blocked invited guests attempting to get to the park. Even with, for that day, an amazing 12,000 Parking Spaces. Add to this food shortages for the overflowing crowd, rides that broke down, or other rides that weren't ready for the opening day. Throw in a rash of counterfeit tickets and a lack of bottled water, in what turned out to be a 100 degree plus heat, and the day went down in Disney History. However, I didn't know what was actually happening at the time. As I, like millions of television viewers, sat in our living rooms enjoying that live broadcast. What eight year old Lloyd DID KNOW was that I wanted to go to Disneyland. I had my 9th Birthday on October 16, 1955 and was told my present was a trip to the "The Magic Kingdom". We went the following November. Today my reader might not look at that gift as much, but remember through Walt's great television merchandising gimmick of telling America about his theme park. Watching the live opening on television and the fact not one of my friends had yet gone there. I was flying over "Neverland" with Peter Pan. It seemed to me to take hours to make the ride out to Anaheim, but then I saw the sign leading to the parking lot on Harbor Boulevard. This was the 1950's and people going to a hotel, or a restaurant at a hotel. Expected to wear a form of dress clothing and for men that might include ties. Telling their guests and visitors that you could wear "Informal Wear" was the oddity of the period and greatly appreciated. Somebody going to the park did not have to change clothing to be in the hotel proper, or dine there. By November 1955 there were now the first "Coupon (Ticket) Books" in use.You had your "Admission Ticket" and " Eight Ride Coupons" labeled "A", "B" and "C". These books also had more "A" and less "C" tickets of course, but you saved money if you purchased them. An "Adult Coupon Book" including your admission ticket to get into the "Disneyland Resort", as the "Park" is now called, in 1955 was $2.50. Today in 2017 that equates to $31.65 as compared to the current ticket price of $110 for an Adult admission. Of course today three are more rides and no need for coupons. Note the "A" Coupon, seen below, had a one ride price of 10 cents, but the "B" and "C" coupons indicate varying prices per ride. Individual "Tickets" for rides could be purchased inside the Park . So if I wanted to do everything my parents went to the ticket booths in each land to buy more. Looking at the above tickets here are the rides that I could choose from that November day. A lot different than now. 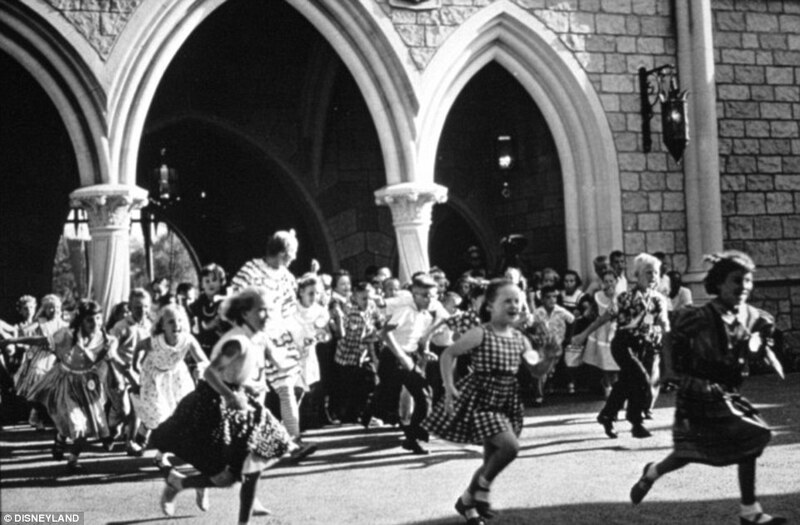 So on that Saturday in November 1955 I had my "Child's Coupon Book" and was set to enter "The Happiest Place on Earth". Oh, it was raining off and on. What would become "Orange County" was known for having a more rainy climate than Los Angeles. Funny thing happened that day. Each time we went inside a building it rained and each time we went outside it stopped. To a nine year old 1950's boy that proved Walt was right. This was THE MAGIC KINGDOM. When we went through the entrance the first thing I encountered were the "Disney Cartoon Characters". Which like in the previous photo of "Snow White" looked a bit crude, but recognizable, by comparison with what visitors see today. Built of wood in the middle of concrete with a small amount of water surrounding it. Tuna sandwiches, tuna salad (served in mini boats), tuna burgers, and hot tuna pies were served at the Pirate Ship Restaurant at the counter below the deck. 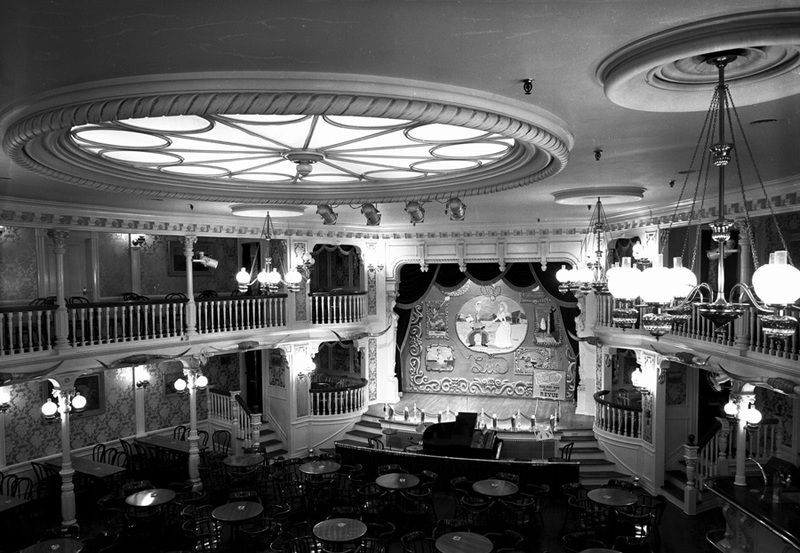 The Pirate Ship Restaurant was also known as Captain Hook’s Pirate Ship and the Chicken of the Sea Restaurant. Nothing like a Tuna Burger with potato chips. It was fun being turned loose on deck. WHAT WHERE THOSE RIDES LIKE BACK IN 1955? 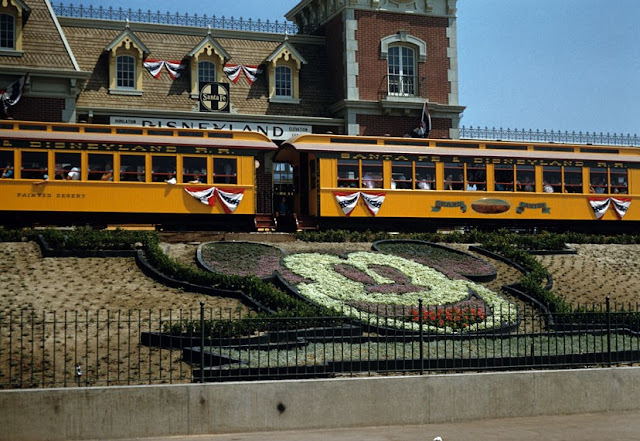 As you entered "Disneyland" you saw the front of the "Main Street Train Station". In 1955 there were two types of trains to ride upon. 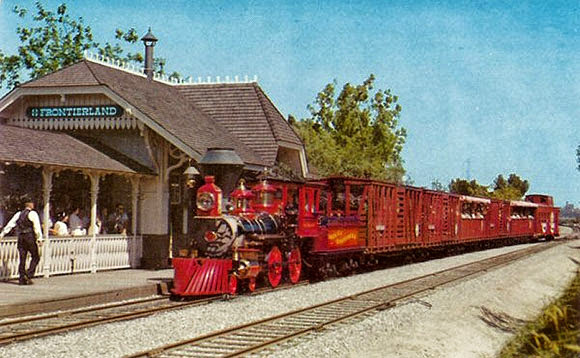 The one my "C Coupon" entitled me to ride boarded at that "Main Street Station" and was the "Passenger Train". 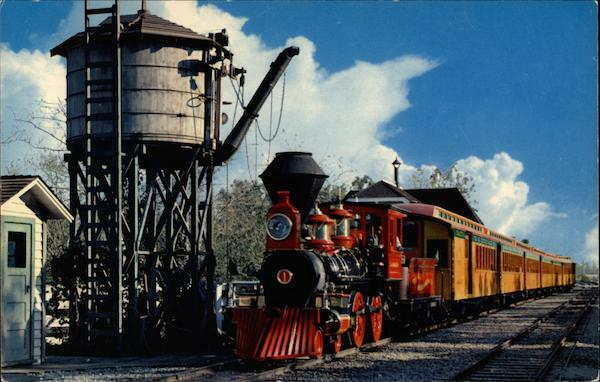 The "Passenger Train Cars" are seen in the first picture and the complete train in the second at the "Frontierland Water Tower" stop. "Main Street" was inspired by Walt Disney's home town of Marceline, Missouri. The street was basically shops and restaurants. As you can see, if you didn't want to walk down to the hub dividing the lands. There were "Period Transportation Vehicles" by using an "A Coupon" to either go to there, or back to the Park's main entrance. A one way ride only. Today you will not see either the "Fire Wagon", or the "Surrey" both were drawn by horses. 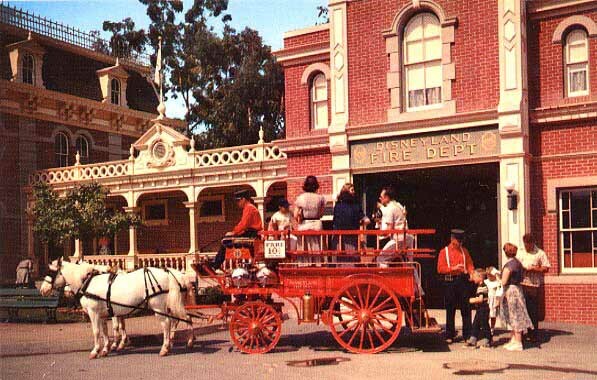 The "Fire Wagon" was stopped in 1960 and is in the Fire Station minus the horse. The "Surrey" was stopped in 1971. 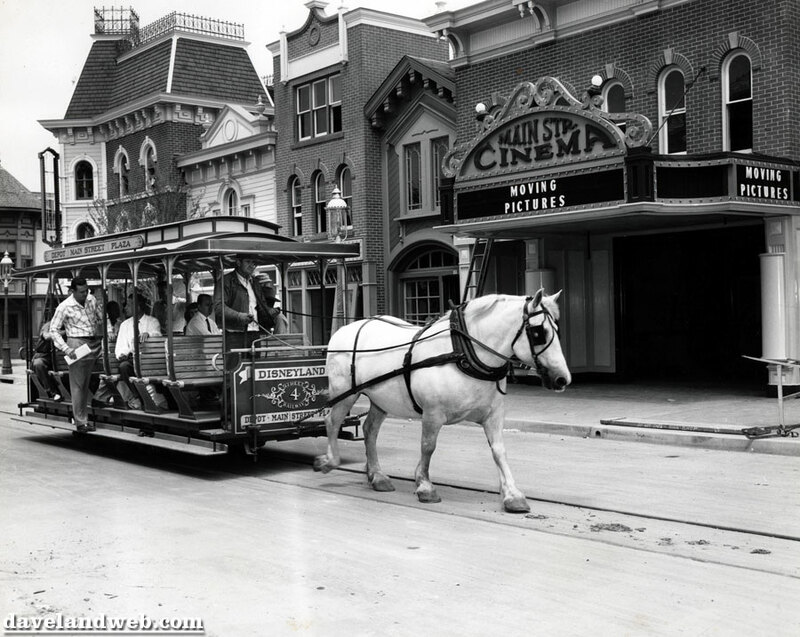 Below the Horse Drawn Street Car passes the "Main Street Cinema". Within the "Main Street Cinema". 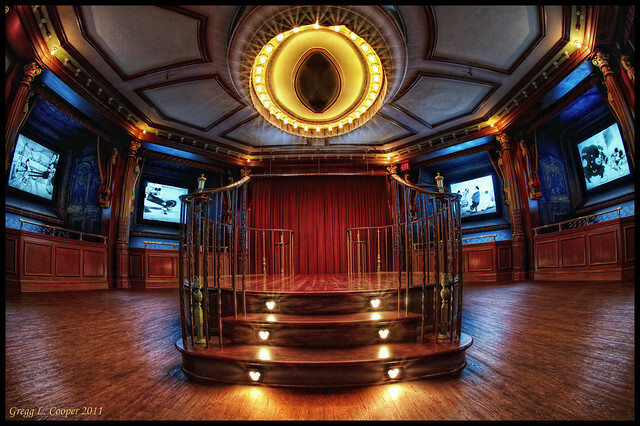 You can view, on multiple screens, original black and white cartoons and shorten versions of silent films. The cinema is still in operation. 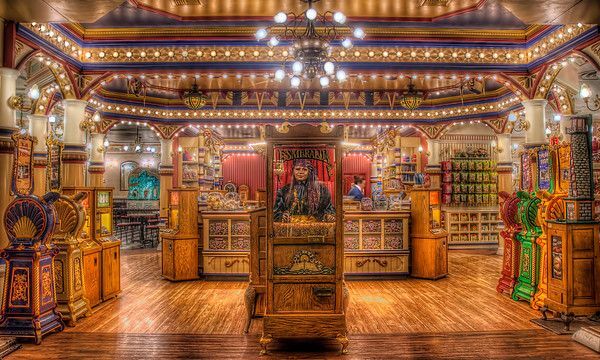 One of the only non-coupon attractions on "Main Street", which is still there, was the "Penny Arcade". Most people know this statue of Walt Disney and Mickey Mouse. However, it wasn't until November 18, 1993 that "Partners" was dedicated and officially appeared there. For the prior 38 years there wasn't anything on the central hubs of "The Magic Kingdom". Moving to the left of the central hub you could enter both "Adventureland" and "Frontierland". 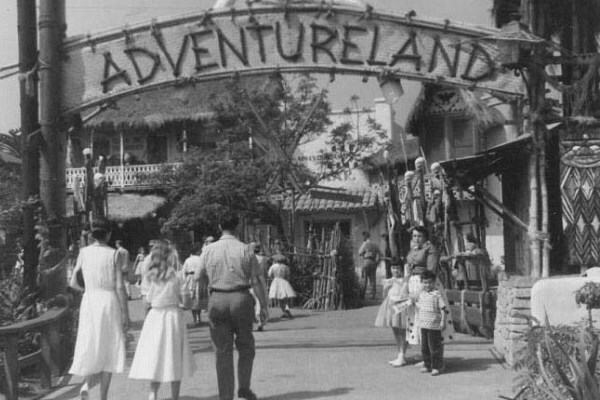 Let me take you to 1955 "Adventureland" first. 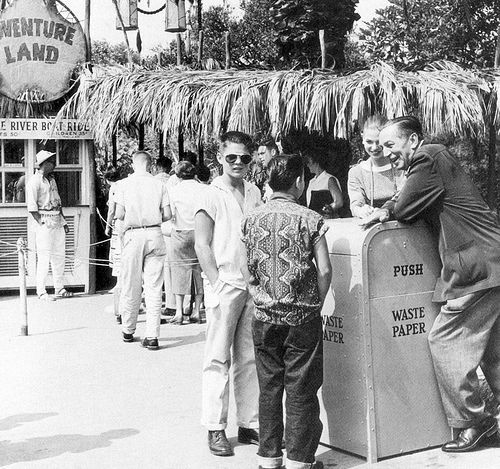 The entrance "Adventureland' hasn't really changed over the years. The cruise down the Amazon and other rivers hasn't changed much, but the animals were updated and a few things were added in 1983. One of them is the Safari sequence with the man claiming the tree and an rhinoceros below him. The following two photos were taken in 1955. Note the large Palm tree that was originally on the property before the park was built. This particular tree, called the “Dominguez Palm,” was a Canary Island Date Palm and it was planted in 1896 as wedding gift to Ron’s Dominguez’s grandparents, who originally lived here. Ron would later became the President of Disneyland. 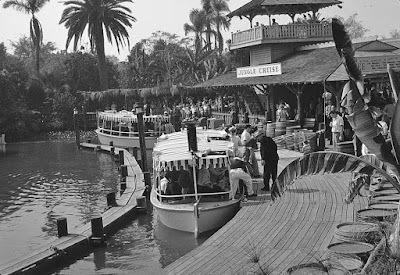 Walt Disney's original idea for the "Adventureland Cruise" was to have live African and South American animal's, but Zoologists told Walt that the animals would just lay around or hide from the boats. 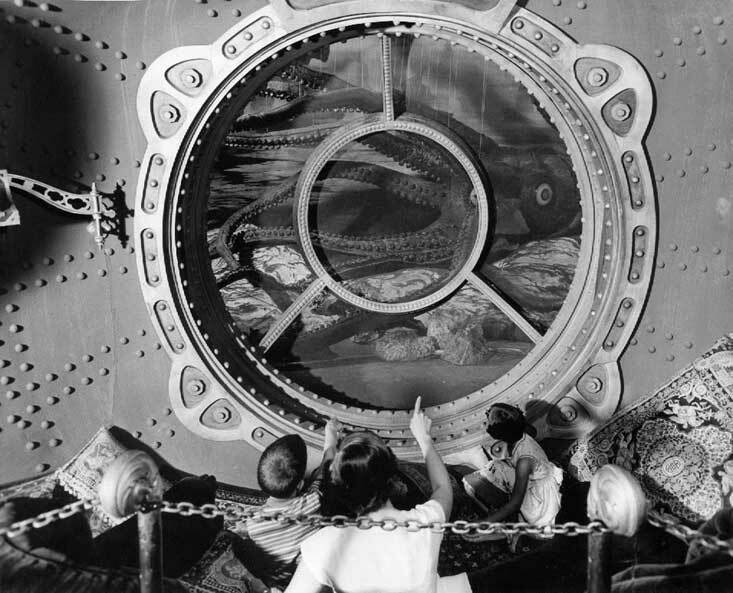 Another plan was to have the cruise resemble some of the Nature Motion Pictures made by Disney. Both, of course, were rejected. Note the guy leaning against the trash can. The two "Safari" merchandise stores haven't changed since 1955, but a restaurant called the "Tropical Cantina" closed in 1962. That year saw "The Swiss Family Robinson Treehouse" built. 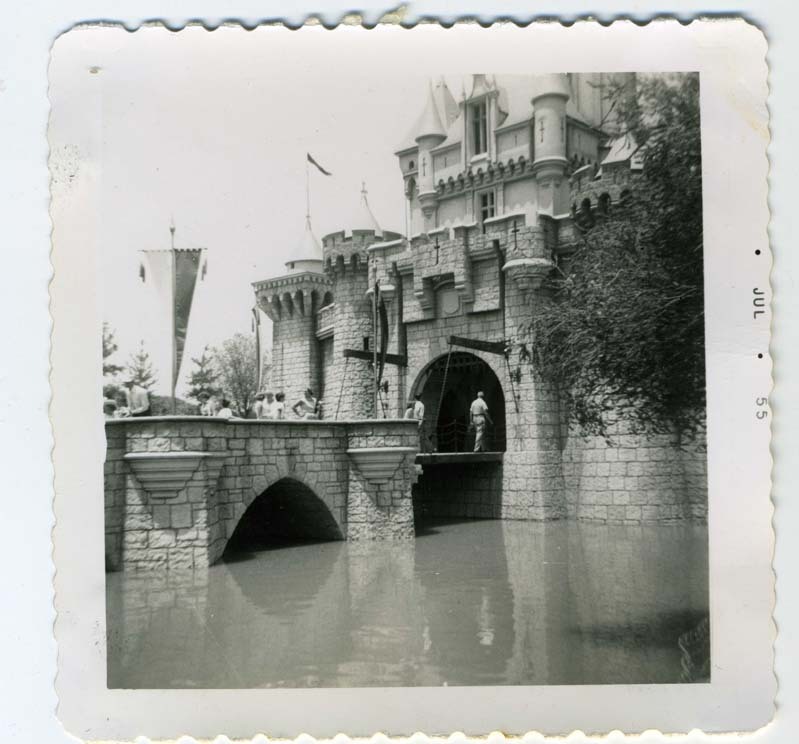 At the time you could enter "Frontierland" from "Adventureland" by walking beside the Rivers of America the same as today, but there was no "New Orleans Square", 1966, or "Pirates of the Caribbean Ride", 1967. Just plants and shrubbery. 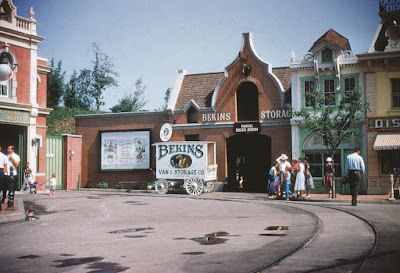 The entrance to "Frontierland" is basically the same, but what was inside was very different. One of the attractions not mentioned on my "Coupons" was the "Indian Village". Here members of different tribes performed traditional dances, made traditional clothing and educated their audience on Native American Life. In this photo you can see visitors to the park around the center circle were the dances were performed. I mentioned there were two trains running around Disneyland. 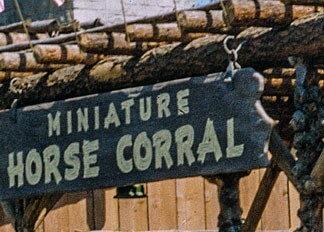 The second was the "Freight Train" and could only be boarded in "Frontierland". 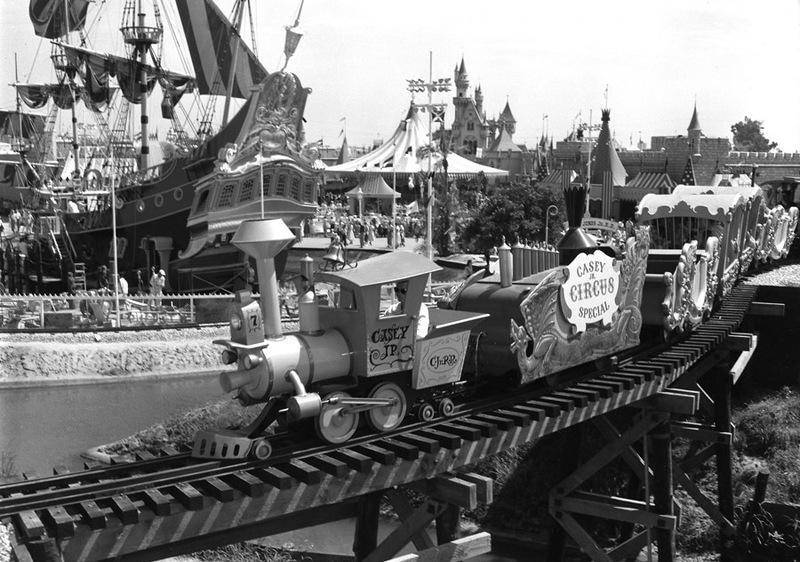 The original plan was to have a "Wild West Show" in that area and this train would be one way, to save walking, to that show. The "Wild West Show" idea was eventually dropped and as changes were done to "Frontierland". The "Freight" joined the "Passenger Train" from the 'Main Street Station". Also note that the "Freight Train" required a "B Coupon", but the 'Passenger Train" a "C Coupon". A marketing trick as the cost for a ride on either in 1955 was 35 cents as indicated on the two coupons. Should you need to purchase an individual ticket for the "Freight Train". Below visitors wait to ride the "Conestoga Wagons" and relive the journey across America in the old West. Which would be recreated the following year in Walt Disney's "Westward Ho the Wagons" starring Fess Parker. Another period ride was the "Mule Pack". Where you rode mules into the 'Painted Desert". 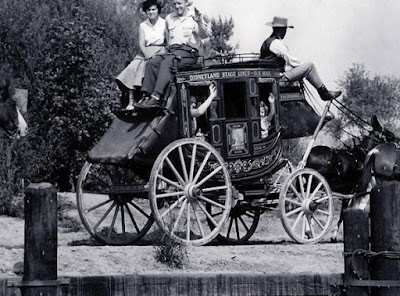 What would the Old West be without a "Stagecoach Ride"? 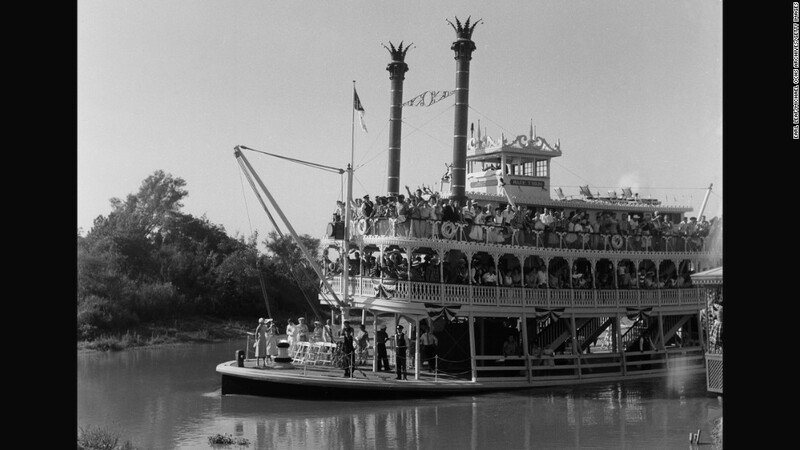 The pride of "Frontierland", at the time, was the "Mark Twain River Boat". 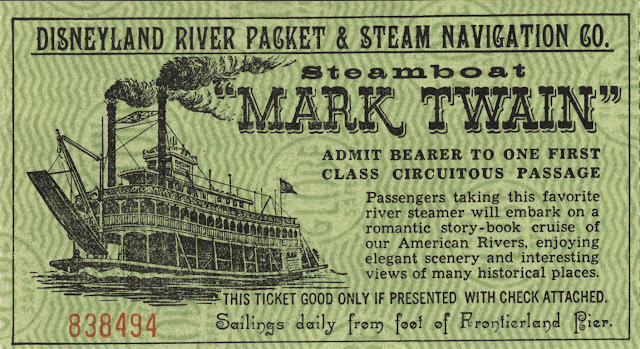 The "Mark Twain" took passengers on the "Rivers of the America". Notice the shoreline behind the boat being mostly just over grown and undeveloped. 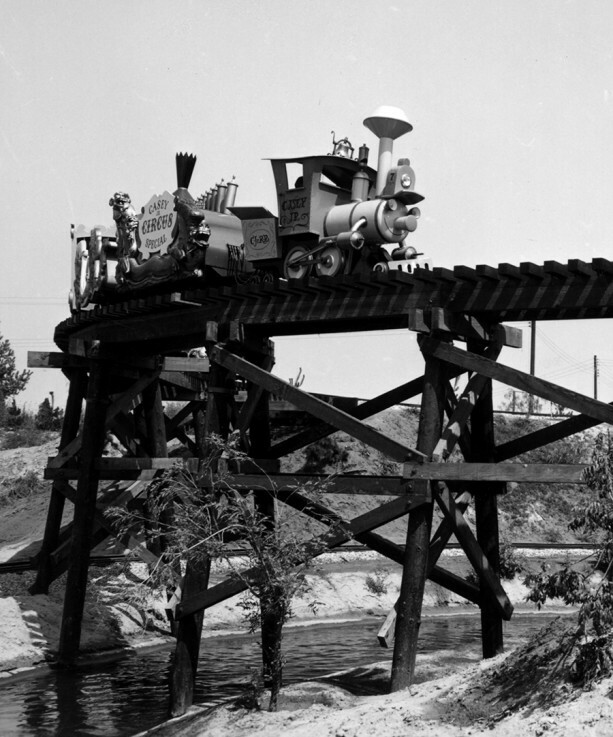 At the time I was first at "Disneyland" I could see "Tom Sawyer's Island" still under construction. The Island would not be completed and opened until the following year. So I had something to look forward too. Also "Mike Fink's Keel Boats" where there at the dock, but would not start operating until the following month. The "Indian War Canoes" didn't open until July 4, 1956. 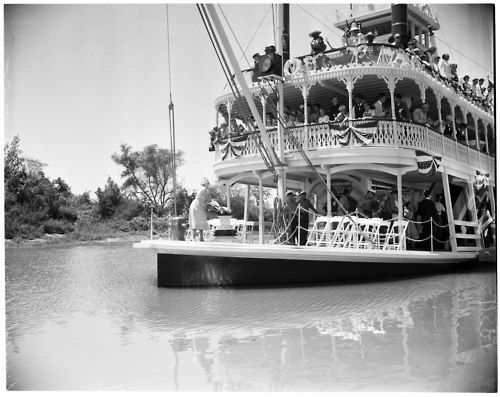 So the only way to go around the river area was by the "Mark Twain". 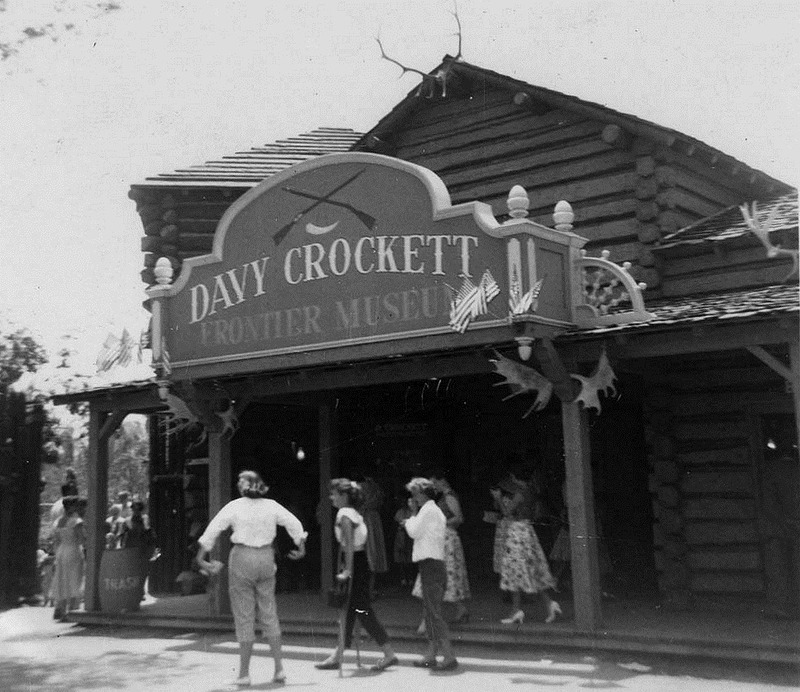 Besides the rides in "Frontierland" you could visit, in 1955 only, "The Davy Crockett Frontier Museum". Inside was a replica of "The Alamo" and other exhibits related to the Walt Disney television mini-series. Which would not conclude with the actual "Alamo Battle" on the "Disneyland" television program until the beginning of December. It was at the "Museum" that my parents purchased for me my "Official Genuine Imitation Davy Crockett Coonskin Cap". Shortly after the mini-series ended. The "Davy Crockett Museum" became a normal shopping emporium. The area was a lot of fun for me and especially now wearing my "Coonskin Cap". 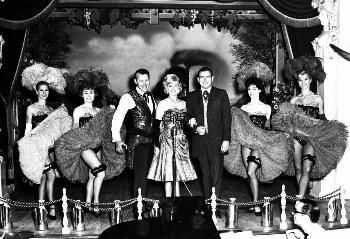 Another place to eat, or just enjoy the show, with a "Pepsi", was "Pecos Bill's Golden Horseshoe Saloon". 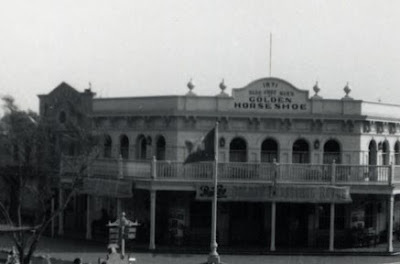 By opening day the name was just shorten to the "Golden Horseshoe Saloon". Although one of the song's and acts had to do with Disney's version of the legend of "Pecos Bill". Moving to "Fantasyland" was actually a return, because we had gone to the "Starkist Captain Hook Pirate Ship" for lunch. Problem came, for my parents and others, as some of us kids started playing pirates on the ships deck and didn't want to go. 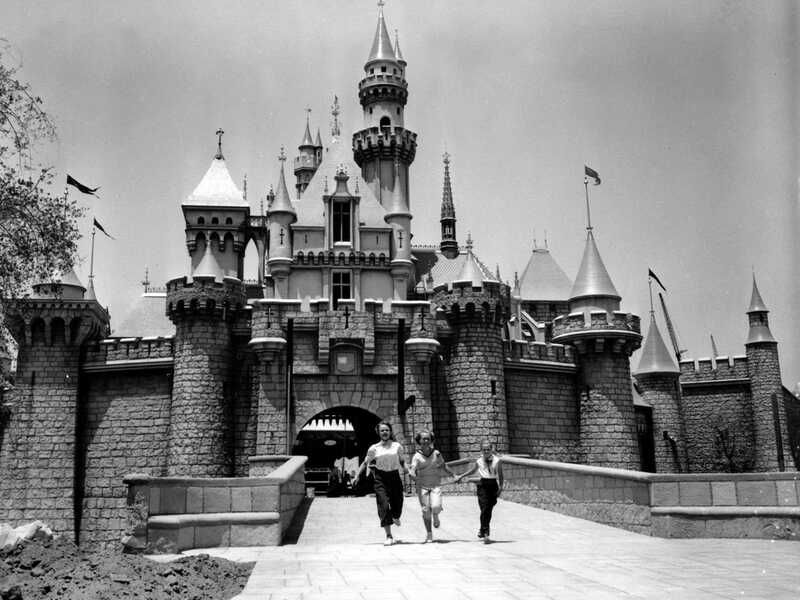 The main entrance to "Fantasyland" was "Sleeping Beauty's Castle" and looks basically the same, but with fresh paint, today as in 1955. However, note the grounds around the castle still had plenty of shrubbery which today are mainly cement walkways and other things. A photo from opening day and would you believe girls wearing dresses. Once inside on the right side, facing the backside of the entrance, is a doorway that takes the visitor into a walk-thru of the castle telling the story of Sleeping Beauty. It would be updated after the Walt Disney animated picture opened in 1959 to reflect those characters. 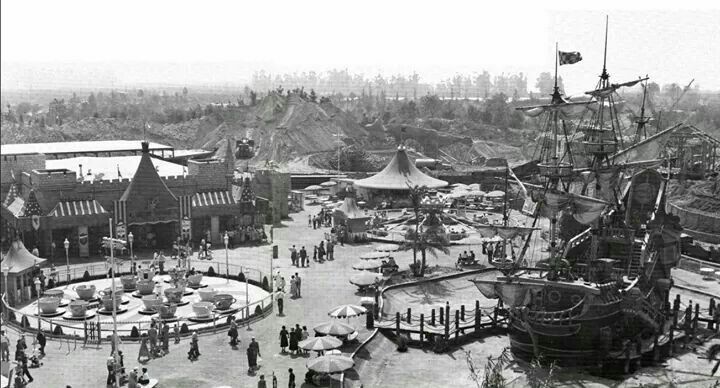 OK, I was inside the "Fantasyland" grounds and this aerial shot should give my reader an idea of how bare compared to today it was in 1955, but the "Chicken of the Sea Pirate Ship" did stand out and dominate the area. Another reason kids gravitated to it to play. In the picture can be seen "King Arthur's Carousel" which only took an "A Coupon" to ride, or 10 cents at the nearest ticket booth. Oh. today, in 2017, that would be 92 cents. 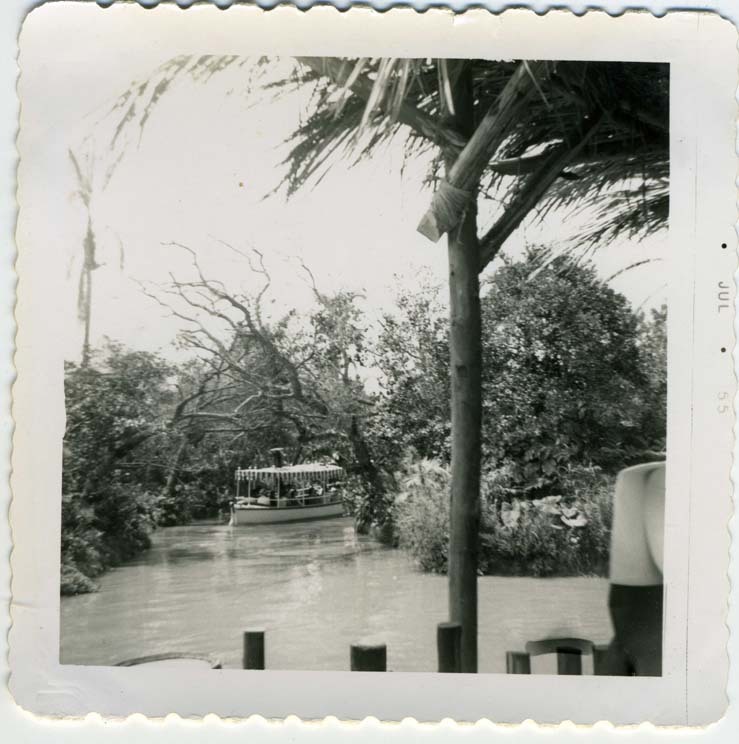 There was a ride called "The Canal Boars of the World" and I could still see them in November, but they only operated between opening day July 17, 1955 through September 16, 1955. Looks kind of familiar? The problem was the boat engines overheated and without landscaping around the canal. The dirt fell into the water creating mud. So the ride was stopped. Landscaping followed after much discussion of what was to actually be seen. 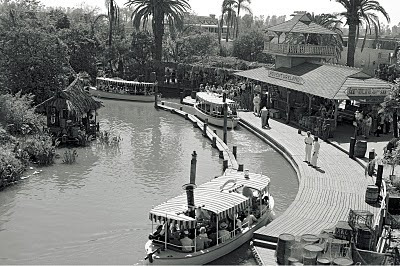 The boats were refurbished with a different design and on June 16, 1956 the attraction would reopen as "Storybook Land". The way I was able to see the area was by the "Casey, Jr. Circus Train" which circled the canal as part of the ride. Again note how barren things were at the park, but that didn't stop a child's fun and of course we knew more would be coming. 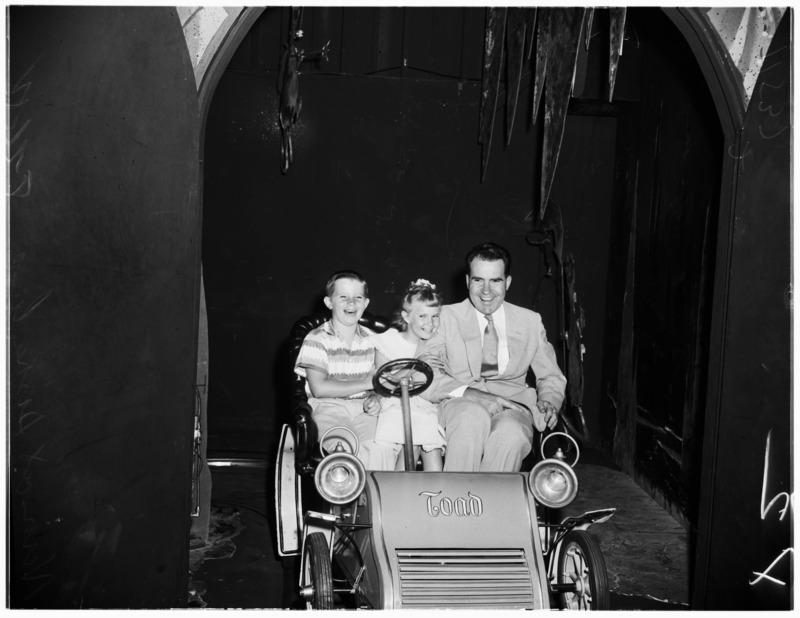 Lloyd was very excited to go to the "Mickey Mouse Club Theater" as just the previous month, on October 3, 1955, the television series had started on ABC. 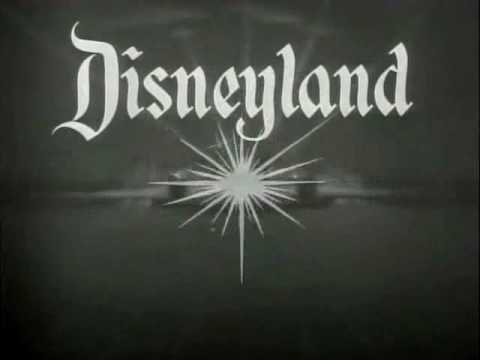 The same network that ran Walt's "Disneyland" television show and on October 10, 1957 would start running Disney's "Zorro". Kids from the audience at the "Mickey Mouse Club Theater" were taken on stage to be part of the show and cartoons were sometimes shown, but most of all on weekends were members of the "Mouseketeers" themselves. At the time an ex-school classmate of mine, Johnny Crawford, had become a "Mouseketeer" and in 1958 I would watch Johnny on "The Rifleman" television series as Chuck Connors' son. Below Walt Disney is riding the "Mad Tea Party" tea cups on opening day. One of only a few "Fantasyland"major rides we've gotten to love over the years that was open. For example "Alice in Wonderland" was still in the planning stages and wouldn't open until June 14, 1958. 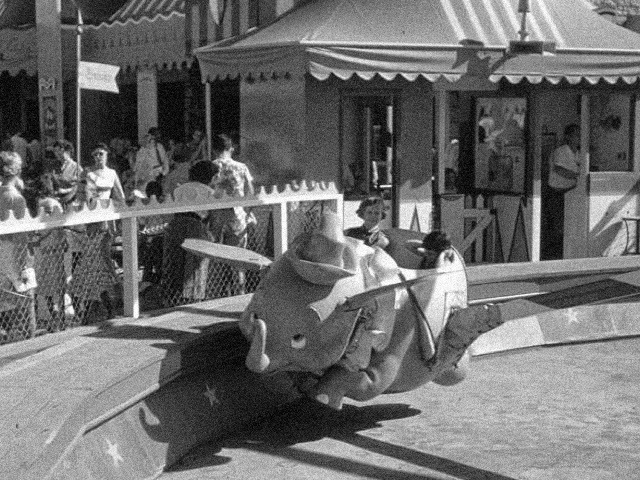 One of the other rides that was there for my first visit was "Dumbo the Flying Elephant". "Second star on the right and straight on 'till morning" led me to one of my favorite rides "Peter Pan's Flight". 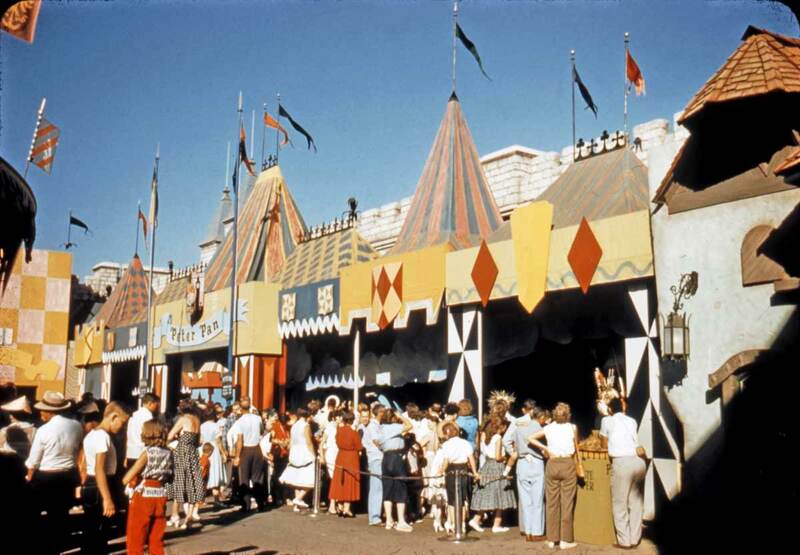 Below is the original 1955 entrance to the ride. This would be changed in 1983 when the ride was also expanded. "Fantasyland" initially had a Medieval design to it, but that would also change to a Swiss Alpine look in 1983. 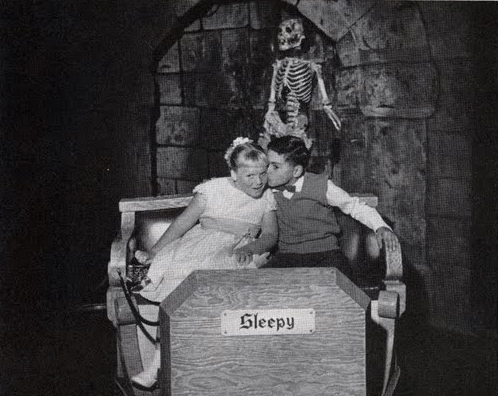 Waiting to go on certain rides, even in 1955, was long. 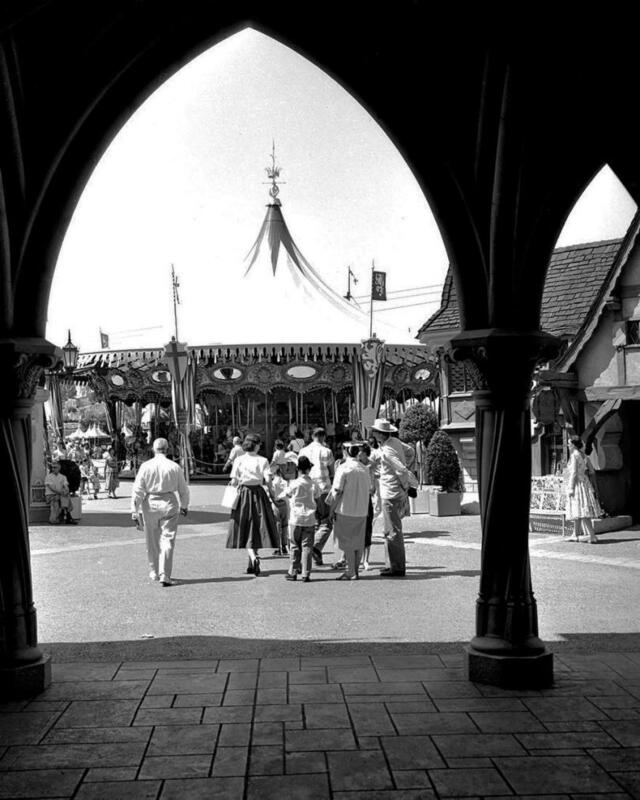 Two of the longest lines were "Peter Pan's Flight" and "Mr. Toad's Wild Ride". 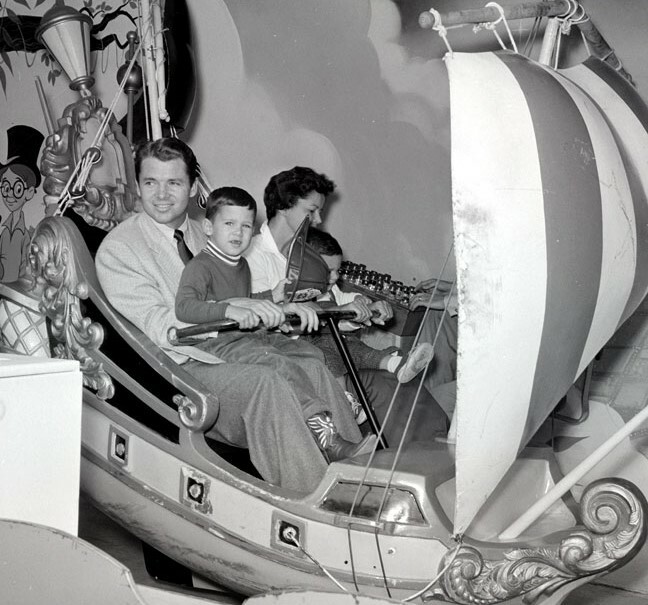 You might recognize World War 2 Hero and Actor Audie Murphy and his family, above, riding the original "Flying Pirate Ships". As I said I loved soaring over "Neverland" and still get a thrill out of the ride today. Speaking of "Mr. Toad's Wild Ride". Originally the "Imagineers" planned "Mr. Toad" to be a roller coaster, but Walt stopped the idea. He wanted all the rides at "Disneyland" to be for all ages and a roller coaster wouldn't fit his concept. So the ride was changed to a fun in the dark. Anyone recognize this rider and his kids, LOL? The last "Fantasyland" ride originally opened in 1955 was "Snow White and Her Adventures".The unexpected happened when small children became very frightened by the ride and word got out to parents to be careful. The operators were alerted to be aware of a child's apparent age. 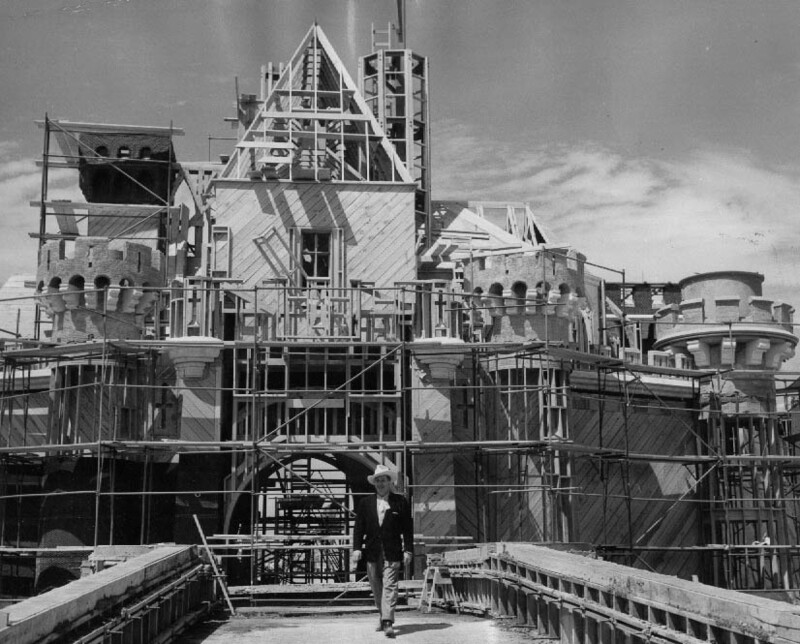 In 1983 with the renovation of "Fantasyland". 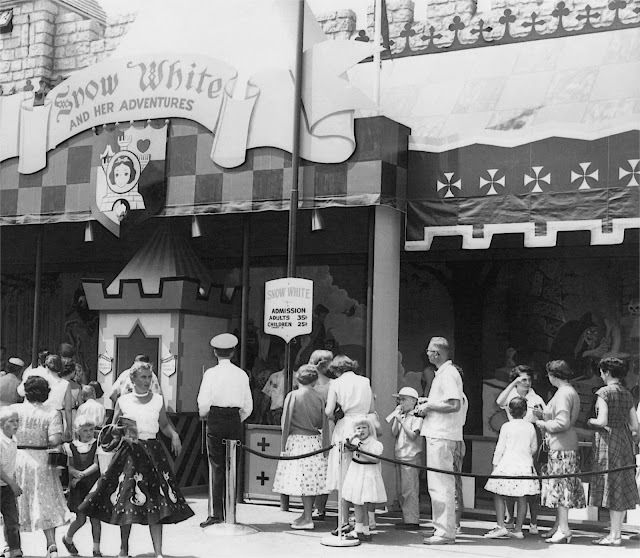 The name of the ride was changed to "Snow White's Scary Adventure" as a means of warning parents. The area that was completely different to what is seen today was "Tomorrowland". One thing my readers must understand is that the year was 1955. Even the first satellite the Russian "Sputnik 1" wasn't launched until October 4, 1957. Let alone a man, again Russian, Yuri Gargarin, did not orbit the earth until April 12, 1961. At the entrance to "Tomorrowland" was "The Clock of Tomorrow". 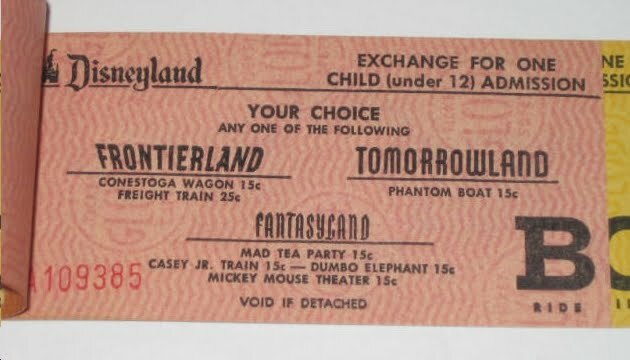 Quoting, after the picture, from "yesterland.com" my reader discovers the year that the original "Tomorrowland" was set in and also gives my reader a little of the dreams of 1955. 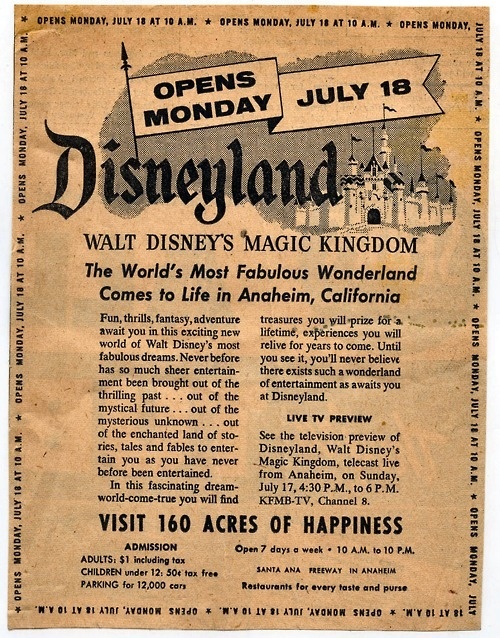 The park’s July 15, 1955, advertising supplement in the Los Angeles Times explains it this way: 1955 becomes 1986 as you enter the new era—Tomorrowland where our hopes and dreams for the future become today’s realities. 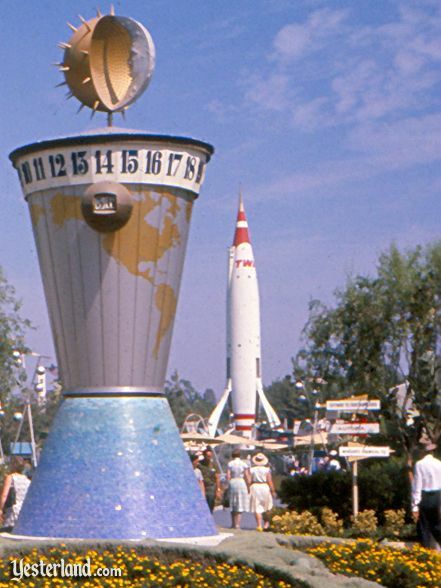 Symbolizing the time transition is Tomorrowland’s futuristic clock. At a glance, this elaborate chronometer tells you the exact minute and hour anywhere on the face of the planet Earth. 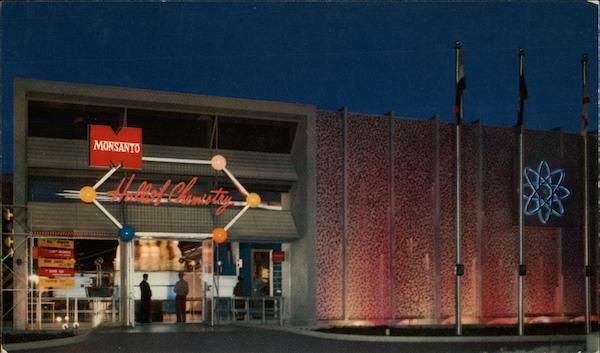 To the immediate right of the Clock was a free exhibit the "Monsanto's Hall of Chemistry" and was open into 1966. Located next to the "Monsanto Hall of Chemistry" was my all time favorite ride, or should I say walk-thru at Disneyland. 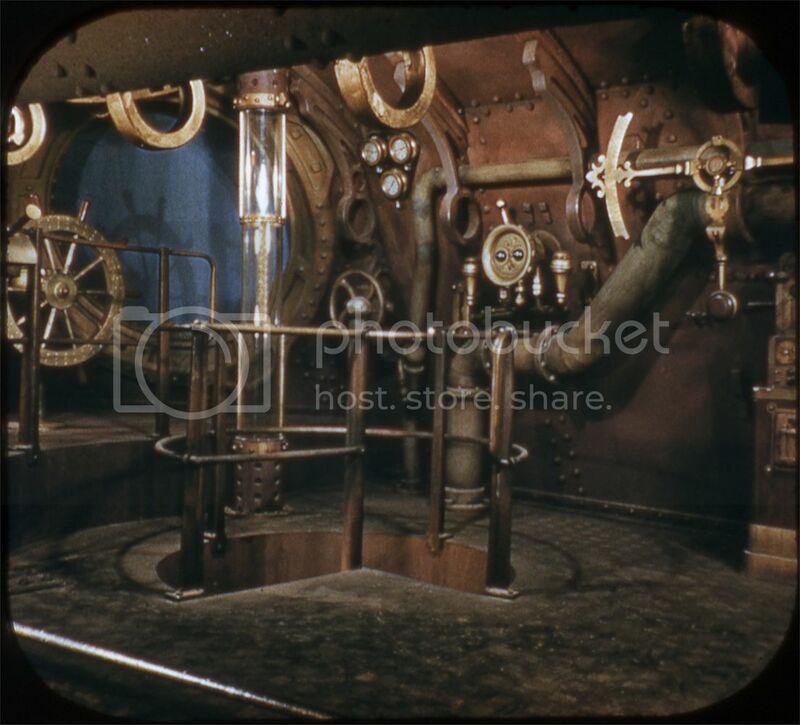 This was the "20,000 Leagues Under the Sea" exhibit. Where any visitor could walk through the sets of the motion picture. It still remains one of the most popular attractions of the original park and lasted for five years until the end of 1960, before being taken down. Ir is also the number request to be returned to the park when the Disney Corporation does a survey. 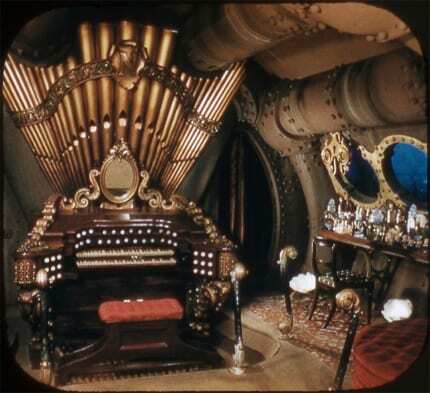 I was able to walk the corridors of the "Nautilus", see "Captain Nemo's giant organ and his quarters. 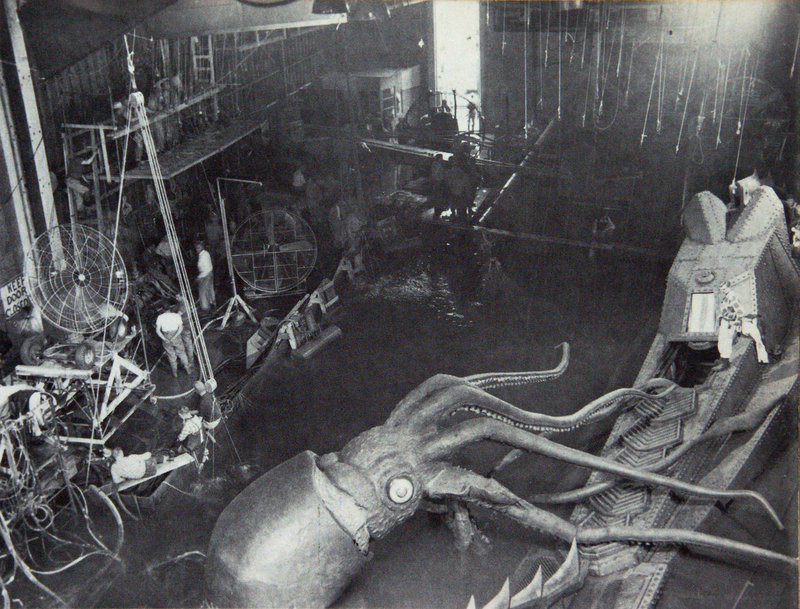 The models actually used in the motion picture were on display and then there was the "Giant Squid". It was amazing to a 9 year old boy with a little imagination. A major requirement for living in the 1950's. The squid was actually moving and that added to the imagination of many 1950's kids. To the left of the Clock there was a free exhibit entitled "A Tour of the West" and hopefully you didn't get dizzy too quickly. Popular at the time was a motion picture gimmick called "Cinerama". Which gave the audience a screen that covered 180 degrees, or the range of normal eyesight. Well the "American Motors Company (AMC)" did one better. "A Tour of the West" was in "CIRCARAMA" What the standing audience saw were screens giving you a full 360 degree motion picture view of travel through the Western United States in documentary style. Of course the FREE exhibit also had the latest "AMC" cars on display as you entered the theater. I said we used a great deal of imagination back then. One of those imaginative walk-thru's was "Space Station X-1". It was at the park until February 17, 1960. Below was the entrance and you basically just walked up stairs and across a walkway as you looked down upon the Earth from space. Art work creating the Earth was imagined by artist Peter Ellenshaw, Looking at the following photo I just love that spacesuit on the Coupon/Ticket taker. In 1958 after the United States launched our own satellite "Explorer 1". The attraction's name was changed to a "Satellite View of America". Howard Hughes owned an airline called "Trans World Airlines (TWA)" and the future of passenger travel came to Disneyland in 1955. 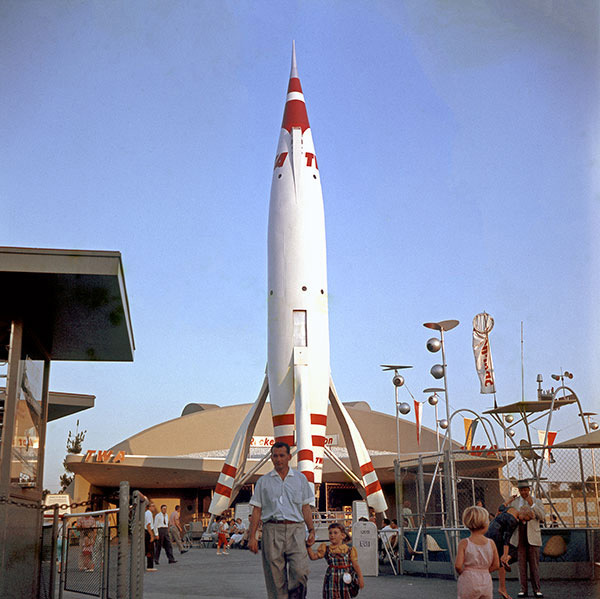 Just to illustrate both our 1950's imagination and lack of what would actually become the future of space travel. 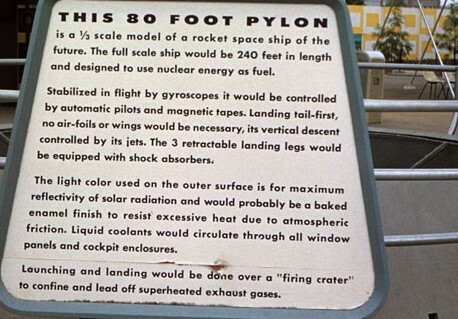 Read this sign by the space craft. Again a non-Coupon book ticket could be much more interesting for this 35 cent ride. For a visitor to go to the Moon. You walked through a command center and then the Stewardesses escorted you to the passenger cabin. There were two viewing screens., One directly in front of our seats and one above our heads. 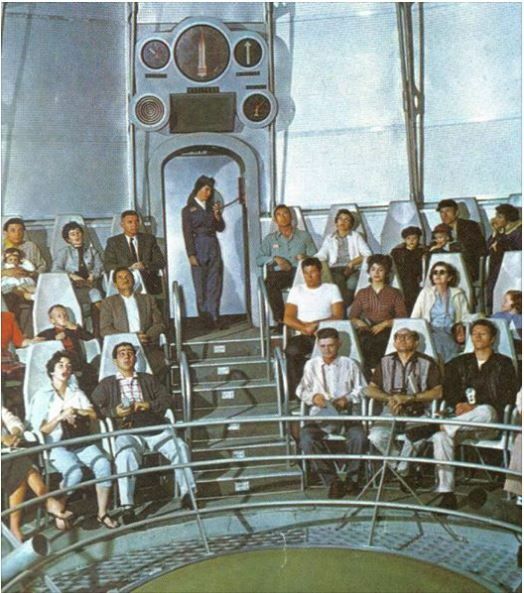 When the ship blasted off from Earth you could feel the acceleration as the seats vibrated. Looking at the closest screen you saw the rear view and looking at the one above our heads the forward view. The trip took the passengers to the Moon. Where we circled it and then our space craft returned us to Earth. 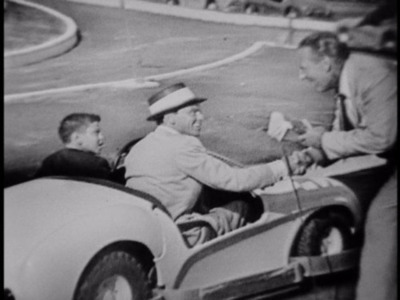 On opening day Art Linkletter speaks to "Frank Sinatra" and his son in one of the original "Autopia Cars". 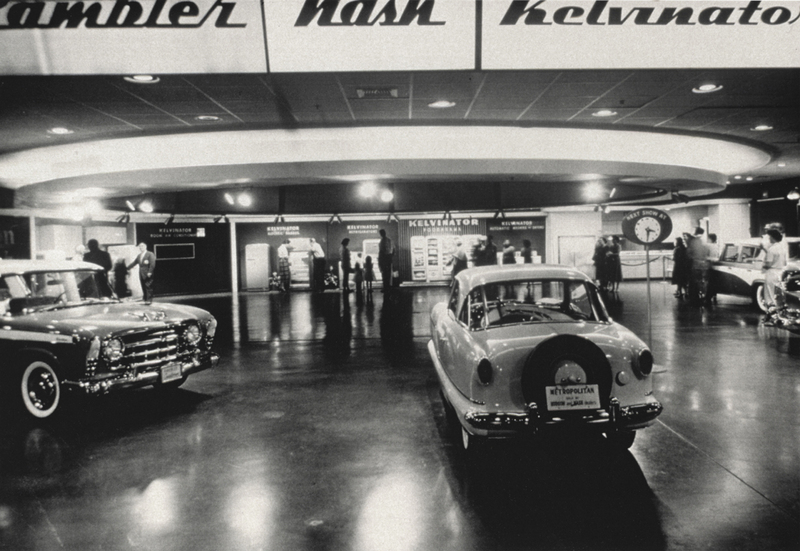 The ride has changed a lot since 1955, but the basic concept remains. 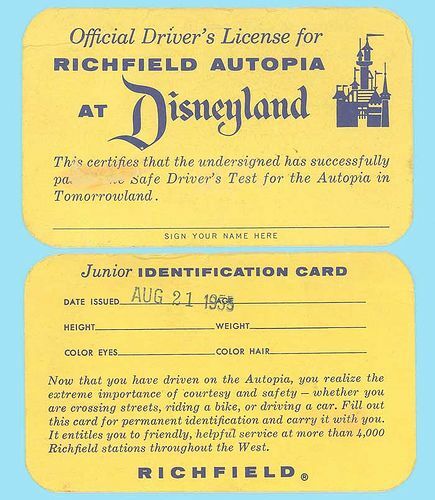 Does anyone remember "Richfield Gas" that sponsored the first "Autopia"? They merged with the "Atlantic Refining Company" in 1966 to become the "Atlantic Richfield Company (ARCO)". I got my first California Drivers License at the age of nine at Disneyland. The last ride in "Tomorrowland" was "The Phantom Boats". Sounds really spooky, but they were a big dud. The boats were in the "Tomorrowland" Lagoon which is about were the submarines are today. 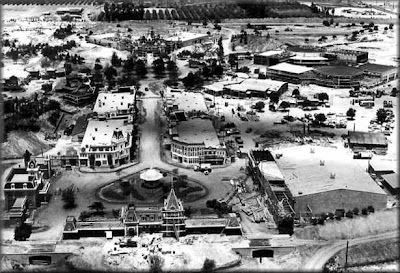 Take a good look at this photo and once more you can see how undeveloped Disneyland was in 1955. Once again giving the impression to Walt that he didn't need to purchase anymore land around his park. 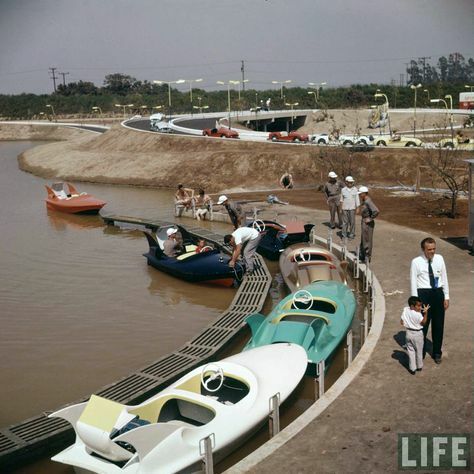 The idea, here, was of a floating "Autopia", but the boat engines kept over heating, the same as the ones on the canal boats, and the design of the fiberglass boat body was poorly conceived and became somewhat unstable. The "Phantom Boats" lasted into 1956 and wre shut down. Nobody really was riding anyway and controlling the time people had a boat out was also a problem. 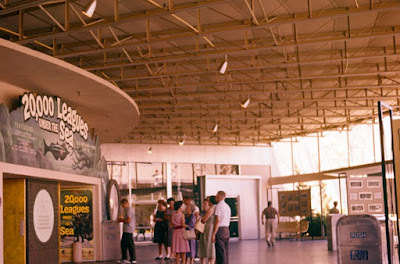 "Richfield Gas" had a free exhibit in "Tomorrowland" called "The World Beneath Us". This plug for the Petroleum Industry lasted into 1960. Such were the things I saw and did on my very busy first visit to "The Happiest Place On Earth". 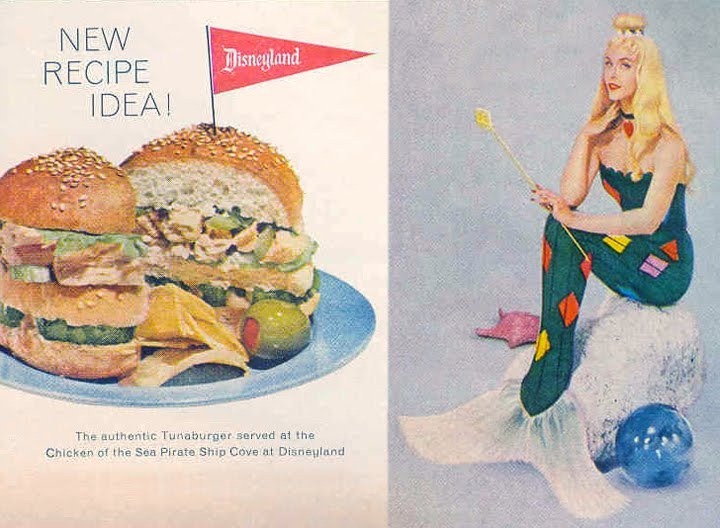 As I said at this article's beginning there have been a lot of changes to "Disneyland" since Walt first dreamed it and more will come over the years, but I felt I would make a little story of what that dream originally looked like to those millions who will never experience it. Related to the above article is one about Robert Newton the star of Walt's "Treasure Island".